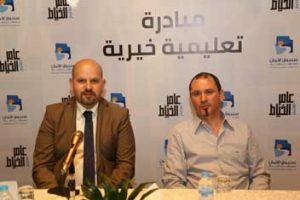 Amman,July 2017 –In efforts to provide orphaned youth with a better future, Amer Al Khayyat, Managing Director at Al Khayyat Motorsin Jordan, launched a personalcharity initiative that aims at granting students from Al Aman Fund for the Future of Orphans access to 11 undergraduate scholarships and ninespecialized vocational trainingopportunities.The announcement was made during a press conference that was held on Wednesday 26July, 2017,and attended by Members of Al Aman Fund’s Board of Directors, in addition to several media representatives. In turn, Ibrahim Al Ahmad, General Manager of Al Aman Fund, expressed his delight with this donation, which will contribute to the Fund’s goalof providing orphans with the education they need to build themselves a brighter future. Founded in 2006 by Her Majesty Queen Rania Al-Abdullah, Al Aman Fund for the Future of Orphans is an independent non-profitorganization registered under the Ministry of Social Development. The Fund aims atsupporting orphaned youth over the age of 18 as theycreatea betterfuture for themselves.So far, 3,186 orphans from acrossthe Kingdom have benefitted from Al Aman Fund,with more than 2,063 graduates currently in the workforce.